It’s no secret that I like beauty boxes, there’s something about opening the shiny box to find perfectly folded tissue paper and an array of beauty products and of course it’s even better when I fall in love with the beauty products. 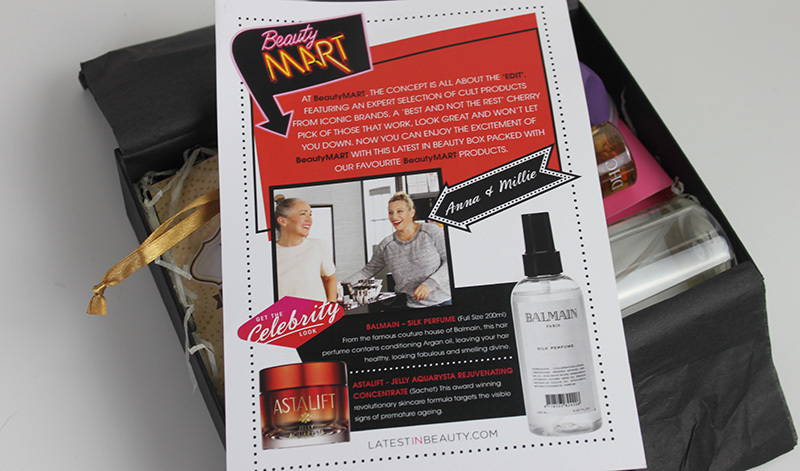 I was very excited to discover the Millie Kendall and Anna-Marie Solowiji, the founders of BeautyMART have joined forces with Latest in Beauty to create a carefully selected beauty box. Once I opened the lid I noticed just how crammed and full the box was, probably the fullest I’ve ever seen a beauty was which was a great start. 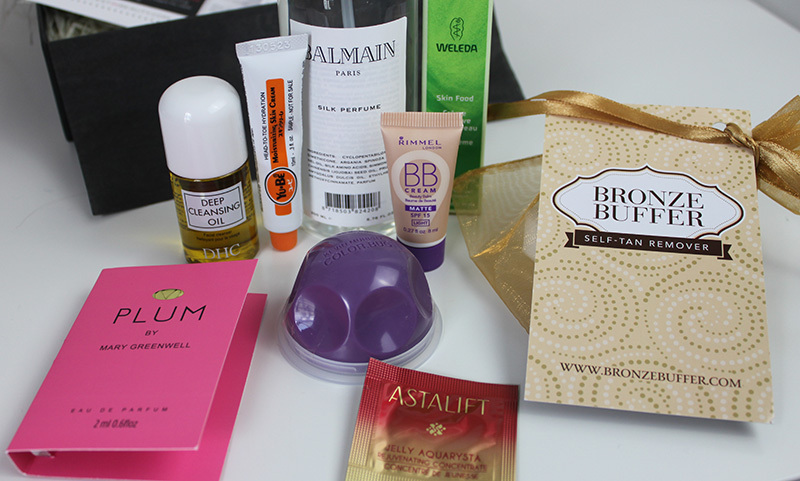 I noticed that there was a range of full size and no so generous samples, as well as quite a few products I’ve received before in other beauty boxes. The smallest size samples were Astalift Jelly and Mary Greenwell’s Plum perfume which I have seen in Beauty boxes before. I have also seen Weleda Skin Food and DHC Cleansing oil however they were both decent size samples and great for travel. The Rimmel BB Matte comes in a small but useable size and luckily in Light which is a shade I would use. The Balmain Silk perfume for hair naturally caught my eye first as it’s a huge full size (retails for £24.50 which is almost double the box price) and I’m actually quite impressed by. I can’t wait to try the Bronze Buffer Tan Remover as I a little sceptical and the Kevin Murphy Colour Bug has been on my wish list for a while. Overall a really nice selection of products, clearly carefully edited- the amount of products and the consistent quality of the products is quite unusual and impressive. It all retails for £12.95 plus P&P and is available to order here while stocks last. 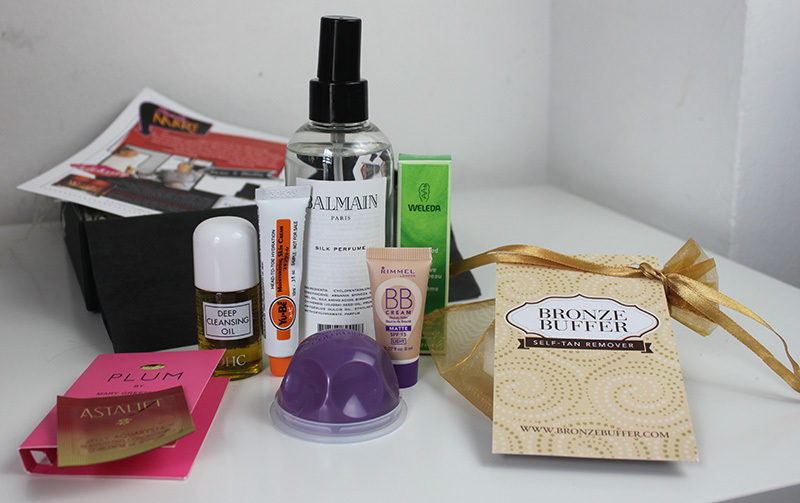 To make the box even better it includes a 20% Off code to use on BeautyMART! The Balmain silk perfume for hair looks really interesting! Would love to know if it's any good, or worth the price tag! The Yube Cream is amazing. I love to put it on my lips before a shower. It makes them so soft. I have the Rimmel BB cream and I must say that I really like it, it is high coverage for a BB cream so on the bad skin days (I don't wear foundation) I always slap that on my face! Hope you get a chance to check out my blog as well.